UNITED STATES DEPARTMENT OF AGRICULTURE "
August I at 1,160 million bushels, the 1946 wheat crop constitutes another record. ent from that of July 1, 1947, when it may be about 275 million bushels. ing countries, unless means are effective to curtail production. and spirits, and greatly to restrict exports. largest on record, the carry-over is the smallest in .20. years, except.for.1937. a. fourth above the 10-year,.1932-41 average. of about 275 million bushels. nationally about $1.L9 per bushel, compared with $1.38 for the 1945 crop. perhaps. at about prewar levels. 8 percent a above the 1935-44 average of 66.3 million acres (table 1). in this and other exporting countries. different from the indicated seedings of 71.9 million acres for the 1946 crop. 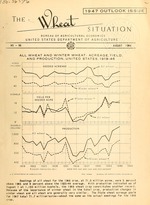 production against needs, are guides to farmers in their 1947 crop planning. United States again in two years. now had 6 consecutive years of yields very much above the long time average. conditions may continue, provision for less favorable years is desirable. II, both the supply and the demand were very large. payment of these premiums, they are not reflected in the ceiling shown in the chart. and marketing season was made July 16 2/. world trade and United States exports ,.ve e very much largeT than in the 1930's. prices of other exporting countries. carry-over stocks ..ould again accumulate. just short of 400 million.bushels. But after the extraordinary demand. may be expected to average well under 100 million bushels. t. '1-99. tines 80 percent eqau-s '1.58. feed 122, seed 81, and exports including ;-hin!,ents 43.
million bushels, ccsistin;g of a carry-over of' old -,he't of 101 millio-. busi els and a prospective crop as of August 1 of 1,160 million bushels. E years, although ever a fort" above the 10-ycar, 1932-41 average. total domestic disappearance is expected to be about 710 million buskels. supply a major portion of the incr.scs in grain exports announced August "'..
stocks 280.9 crop 1,123.1, imports 1.9, rma. :ing total supplies 1,405.9; food..
tribution 913.5 and exports, including shipmronts to .3. S. possessions, 591U3. 3/ Statement on page 12.
winter wh1at nade u-p 879.9 million (table 1), and spring wheat 250.5 million. raised the production outlook 70 million bushels abovo the July 1 estimate. for 1946 with comparisons are shown in table 6.
of the OPA and have now returned to near the levels of June 30(table 7). Who Sold 'he,-t TUnder O l0144. on July 29 in accordance with the provisions of the Price Control Extension Act. any forward date the producer elects prior to April 1, 1947.
percent of -pazity at the beginning of the mark ting year, July 1.
bushel above the rates announced on June 11.
and Baltimore $1.81; and atLcuisaville $1.72. million bushels,-about 4 million bushels below the grind in the previous year. before. Seventy-five percent of the inspected receipts graded No. 2 or better. bushels of wheat and flour. for other food and non-food purposes are being continued. in all areas only by the over-all grain use limitation. of distilled spirits and in breweries is being continued. rice which can be used for this -purpose. in recent months, to a level of approximately 3 million bushels for September. 458 million bushels (table 12). overs, world wheat needs will have to cone out of the 1946 crop. and that the production may fall short of 19 million bushels. Even at that. acreage maintained at the relatively high level of 1945. (1935-39) average, is shapely above the much reduced crops in 1944 and 1945.
countries in this area. The outlook in both Poland and Germany is not promising. great importance in Germany's intensive cultivation. 'idl e Eire was cut off from usual imports. reports, are not expected to exceed the low average of recent years. various central and west China Provinces. was estimated to be 25.2 million acres compared with 22.6 million acres in 1C45. 546 thousand compared with 675 thousand a year ago. northern ITew Wales, and Queensland, but elsewhere moisture is generally adequate. and perhaps at about prewar levels. tiated by December 31, 1949. Part of the .wheat may be supplied in the form of flour. $2.02 for iNo 2, and $2.00 for No., 3, basis in store Fort Willian or Port Arthur. tion of the pool on July 31, 1950.
actual cost to millers and $1.25 per buahel paid by millers for wheat. the circumstances, it is deemed as large as feasible. sumption of rye for food following the limited supplies available in 1946-47.
curtailed and exports kept very small. the highest levels since 1918. Supplies of rye in Canada available for export during 1946-47 are low. to ..only 1.8 million-bushels in 1945.
include interior mill and elevator stocks..
2/ ,stimiates based on trade information related to the Census of 1939.
imports have been larger than exports in 9 of the past 13 years. MCO AR.ao flub Or... neaan.r urn. ~: :: ; Total : Exports: Domestic -r ,rance . :Mil. b'u. Mil. bu. Mil. bu, Mil. bu. Mil. bu. Mil. bu. Mil. bu, Mil. buh. Mil.bu. Mil. buo Mil. bu. 4.9 115.5 115.5 115.5 115.5 115. .
pages 12 and 13; 1922-3Q, Auv--st 1945, peage 2021..c .
SBori -nI:'. 1938.inclhaies unredeemed -loans at- average loan ;value. for July 1946 = 5S.4 x 199 = 176. 1945 :158.3 159.8 162.1 168.3 16,.9 169.2 169.2 169.1 172.6 172.1 --- 186.1 153.
on March 4, 1946 to 172.1, and on May713, 1946 to'187.1. On June .30n1946 ceilings. .Hard Red *:Soft Red Hard Red rn . ......1,000 bu. .1,000 bu. 1,000 bu. 1,000 'bu. 1,000 bu. : 1,000 bu. ember 1945, page 14... .
/ Residual. J/ Less than 50,000 bushels. 4/ Preliminary. nearest midmonth, Jan.-August 1946, Weekly July-August 1946. Date :No. 1 H.D.-T, Sp1o.3 Canada iqo.1 D.HE.. :. at Duluth :Fort William: 1 : Portland : . j .o.b., spot or to arrive. 2 Incudies Canadian ~heat in the United States. Table 13.- h&e4 production in &r Eur c: Pr. 'reotivc 19- 0-rop, -ith corriprisons'. (sl'or. i pFar~.thess) ase,'r, s n for,'i n ."rvice reports t.,rnd othicr infor. : t.ion. I/' roducti,:; for 19 5 oniv. 2 0 Hot. ;t : rt ,ly o':or-l. l o i"'. Jr'.c,.din- es'&i- +. ;:_ sircc Pu h.:ri,:i is exclu'd d.
SBc aed o: pru:,:;.r,: lon 'ri, "r :1h ,-, 19 5 . ': 19:6. Pr li'-inary for 1C .'f. 58.8 64.6 59.1 59.5 70.3 74.7 79.2 82.9 80.9 87,2 94.1 753. 95.4 101.4 100.5 111.' 120.2 127.0- 12.5 125.5 127. 1119.4 112.1 108. 14-11.2 151.7 164.3 18t.9 175,2 198. 212.9 c .2 269.8 284,.1 285.2 170.
page 1~, 191.7-59,.March-April 19 5, p'r:e 1,.
average loan value. 4/ Preliminary. 22/ monthly price, o b .t.. .i t production t obtp-in ft price for the. for July 1946 =. 72.0 x: 199 13. .
1942-43 ....... .... ......... .".. ........... ...o. Acreage, yicld, producction, aQn f6rn dispoitio. Acreage. 'secdei b.: ro-~os,. 9~-5 ...*... *....*..
oPfoducion u 1 -v14. cr : l '',-_-. Q ., ..
Acr-eage and per-cerita-ge of r-i's- claS .e ....... . Percentage monthly y siles, *.v-er-: 1972-41, an,. Acre' e, yield, an.d prcIuction, C.-rda, 1905-..15 .